Check in was late at 4pm which was a challenge as we had left home at 5am. However it was quick and we were shown to our room. We were given a comprehensive tour which was welcome. The room was in the classic style and featured a very large comfortable bed. My wife found that the removal of soaps were a little wasteful and frustrating. On the morning of our anniversary we were woken at 8.30am by workmen hammering in the garden. This occurred again on our last morning. Check out was a little awkward as there was a mix up with the paperwork. The hotel wanted to charge us for drinks in the bar despite the fact we had not been in the bar. Furthermore there was a charge for parking despite us arriving by bus. However these add ons were quickly waived. A really beautiful hotel in the medieval citadel. The service here is exceptional. Nothing is too much trouble. They emailed us beforehand to ask if we wanted them to arrange a taxi for us to transfer from the airport to the hotel (its only a 20 minute drive away) and arranged this for us. They brought our luggage up from their private car park to the hotel (there are no cars allowed in the medieval city), and gave us a guided tour of the hotel before bringing our luggage to the room. The hotel isn't cheap but its certainly worth every penny. The Michelin starred restaurant in the hotel (La Barbacane) is fantastic and lunch there is actually very good value. There are lots of good places to eat within the city walls and its the most beautiful place to wander around its cobbled streets. The tour of the Chateau Comtal and walking the ramparts is worth doing as the views are terrific. Within easy walking distance from the walled city there are other really good places to eat and drink. We loved La Trouvale, great French cooking and reasonably priced. Also on the same street (Rue Trivalle) is the truffle restaurant Barriere Truffes. A great experience with a wine tasting before you eat and truffles with everything but not cheap. Be sure to book restaurants rather than walking in as they are often full in the evenings. During the day, its definitely worth walking over the old bridge into the other part of Carcassonne. There are lots of bars, cafes, restaurants, shops and the main square is lovely to sit and watch the world go by. Its also lovely to walk through the town down to the Canal du Midi where they do trips down the canal. 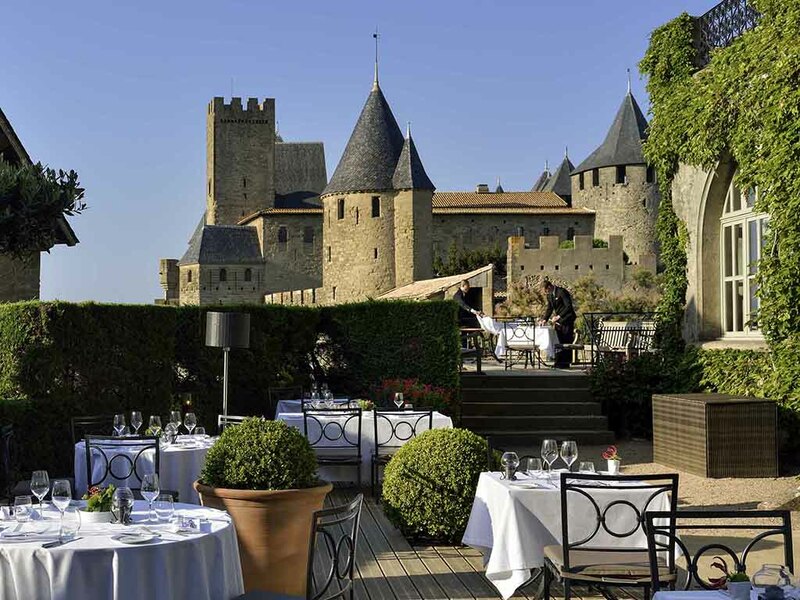 Carcassonne is the perfect place for a short break and if you want to experience a bit of luxury then the Hotel de la Cite is definitely the place for that. This was a special treat for my Husband's birthday, as we had visited Carcassonne before and saw the Hotel, which we thought was lovely and it is a charming beautiful old building. Our only request when booking the room with central reservations, was that we would have liked to get into the room a little earlier as we had an early flight. On arrival we asked if it was possible and went out for lunch and came back around 2.40pm, but we were told we could not get in as the previous guests in the room were the last to leave the hotel and so not possible to get the room early, we waited in the lounge and got in at 4.05pm. On departure the reception staff, when we booked the taxi asked if we wanted the room a little longer as our flight was later, we said it would be nice until around 1pm ( instead of 12pm- so 1 hour extra) , upon reception checking with housekeeping at 10am in the morning , it was not possible. The international channels on the TV did not work and the aircon also was not available at that time, as they still had the heating on and could not have both working at the same time. The television was fixed by the maintenance man and the heating was turned off in our room, and they gave us a fan. The room was big and comfortable enough, but very dark with no real outlook over the ramparts as advertised so not really a room you would want to spend much time. There was a view of the garden through the bushes and trees, but no real outlook. They did however put ballons in the room and a bottle of sparking wine for my husbands birthday, which was a nice unexpected touch, so credit where it is due. The breakfast and bar staff were friendly and attentive enough. Unfortunately I was rather underwhelmed by the experience all in all, what a shame. Beautiful hotel, fantastic staff, wonderful service. On arrival we were upgraded to a suite which was a wonderful surprise. The suite was beautiful, as was the rest of the hotel. All the staff were fantastic and the service they gave was first class, nothing was too much trouble for any of them. Our visit to you exceeded all our expectations and the tour of the hotel on arrival was a lovely way to begin our stay. The staff and service are first class. The rooms beautifully appointed. Everything you expect from a five star hotel in a magical location. Great place to stay. Th hotel occupies a perfect position to explore the old town. The hotel has a very good team who go out of their way so as to ensure that you have a memorable time.The restaurant provides excellent value for money. Fantastic experience from beginning to end ! We were made to feel very special and were upgraded to a superior room for our wedding anniversary which was a lovely touch. It’s a very quiet hotel and maybe a little bit of light music in the hotel bar in the evening would be nice. Would definitely recommend and would like to visit this hotel again. We were absolutely delighted that we had booked the Hotel de la Cite. From the arrival, being met at the car park, to the great food, wonderful location and such lovely staff there was nothing not to like. Our room was perfect, very clean with loads of little touches that made us feel special - chocolates shaped like the hotel for one, big warm, fluffy towels, great wash products. I would recommend this hotel to anyone wanting to make their hotel part of their experience in Carcassonne. The quality of the staff, accommodation, food and location were all exceptional. This is a special place to stay. We have stayed previously (some 10 years go) and it remains excellent in all respects. We have been using Accord Group Hotels for several years now and this is without doubt the best one we have ever stayed in. Our recent trips have included Sofitel Le Grand Ducal in Luxembourg and Sofitel Lisbon Liberade but this hotel surpasses them. Firstly it is in the ideal location for exploring the old cite, secondly it oozes history but more importantly it does the simple things calmly quietly and very efficiently. For example providing an orthopaedic pillow from the pillow menu on request, providing extra coffee pods for the in room hospitality tray and replenishing bathroom toiletries without being asked. Without exception all staff we encountered were superb, charming friendly and helpful and doing so in a very genuine manner that actually made you feel very welcome. Our rooms were cleaned to a very high standard and the public rooms immaculate. Breakfast was superb lots of choice to cater for all tastes even for us as vegetarians. Particularly enjoyable was the daily fresh fruit salad and the variety of freshly squeezed fruit juices. Hot food as well as cold food and omelettes etc and freshly cooked eggs that you ordered from your waiter. Our one disappointment was that as much as we would have loved to try the restaurant for dinner we did not simply because in our opinion there was a non existent choice of main courses for vegetarians. This is something we often encounter on our travels. That having been said it is the best hotel we have ever stayed at in over 40 years of travel. Great location, lovely cosy bar and beautiful terrace with nice bedroom. The staff were quite junior though and service slow in bar and at breakfast, which was average. An absolutely magnificent experience throughout opur stay. From checking in to leaving 6 days later we were very impressed particularly with all the staff members we encountered. The building itself so steeped in history, every room so enchanting so spotlessly clean, wonderful furnishings beautiful ornaments and paintings almost unique in our opinion. Comfortable beds, lovely room, helpful staff and amazing location. I was delighted on arrival that for once the hotel was even better than the photos on the website. Extremely friendly and efficient staff, from our arrival at the car park outside of the ramparts, we were driven to the hotel by a very knowledgeable driver so a mini tour! On checking in we were offered a free guided tour which they booked for us. Have to say the guide was fantastic and was the highlight of our visit. Our room was beautiful but the bath is quite high to climb into, if you are not so agile. The bar is fabulous and it was great to pop back for a coffee or a glass of wine to fortify us during the day. The breakfast was a bit disappointing, limited hot dishes though you can order eggs from the waiter. However we did enjoy the bread and croissants. All in all we thoroughly enjoyed our stay and will definitely recommend your hotel to our friends. A wonderful and spoiling 4 night break. The location of the hotel next to the Basilica of St. Nazarre in the medaeval Cite of Carcassonne is unique.The views over the battlements and the Bastide of St. Louis to the Pyrannees and B. Mountains is breathtaking. The public rooms are beautifully appointed with period furniture and art. For our 4 night stay we were upgraded to a corner suite with sensational views over the gardens and Bastide in one direction and the Chateau Comtal in another. Our suite was luxurious and spacious. We had breakfast and dinner in the gothic restaurant. The breakfasts were superb, particularly the fresh orange and the scrambled eggs, bacon tomatoes and mushrooms. We only had room for a main course and pudding. Our favourites were the lobster an the souffle. The staff throughout the hotel were impeccable, friendly and welcoming. We will be recommending a stay at the hotel to our family and friends.